January put an end to the milder-than-usual temperatures that allowed us to use our reverse-cycle HVAC heat to stay warm. 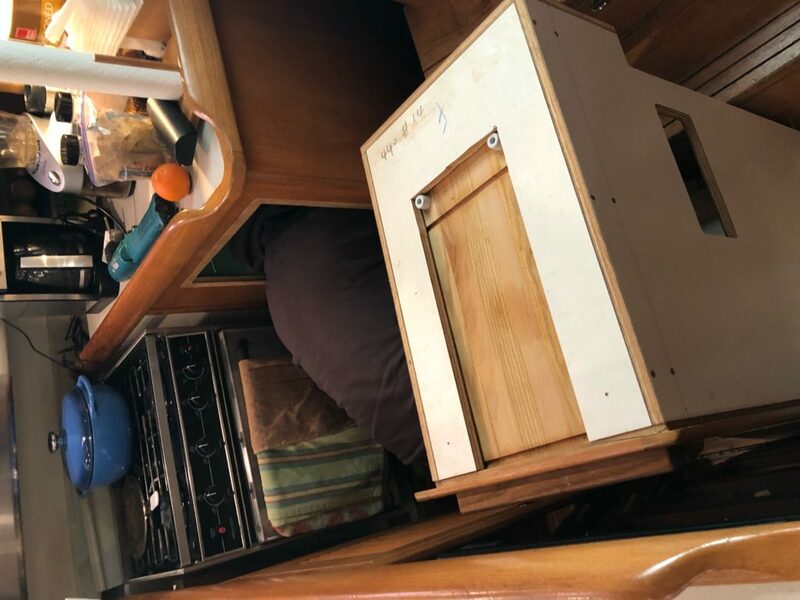 We have shore power, so we thought some small electric space heaters could keep the boat “liveable” and our systems above freezing. A night with temperatures dropping into the teens dispelled that notion, so we quickly looked into potential options. 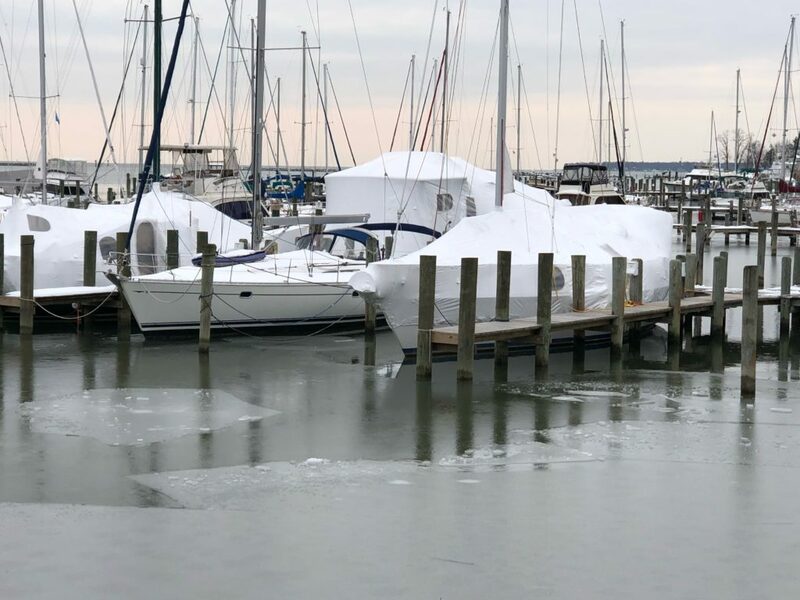 As the water freezes, a de-icer or “bubbler” keeps the water around Vinyasa in motion and prevents ice from forming around the boat. Her plastic wrap covering keeps the boat warmer than she would be otherwise. Our initial thought was an Espar diesel heater. But we hope to be in warmer waters next January, so spending $6,000 to $8,000 on the heater and its professional installation made winterizing or hauling the boat out, and moving into an AirBnB for six weeks an appealing alternative. An excellent father-son team from the family-run Annapolis Cruisair then suggested we consider adding an inline Dometic module to our installed Cruisair HVAC system. It wouldn’t match the heat generated by an Espar, but given our cruising plans, it would be good enough. Parts and labor were estimated at about $1,900, and it would not require additional holes in Vinyasa’s hull or deck -which we had not been looking forward to. Plus, they could do the work soon! The next day, Bryan and Matt arrived on time and were a pleasure to have onboard. 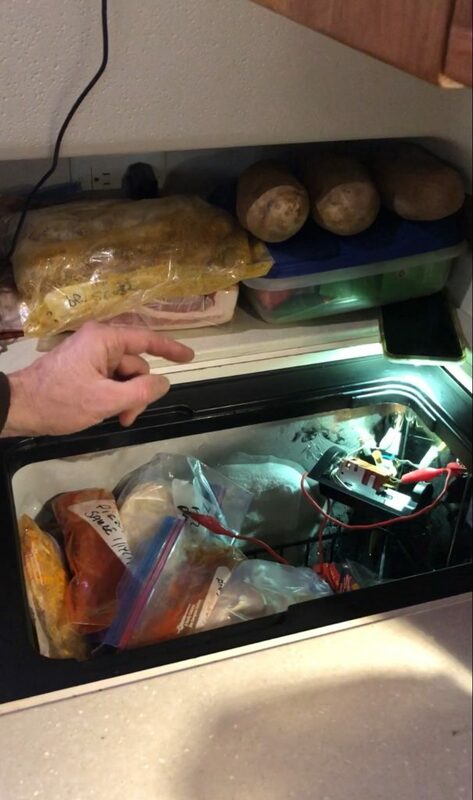 While Matt tackled the Dometic installation, Bryan was kind enough to do some extensive troubleshooting on our Waeco freezer, which works well with shore power but fails when we are running on batteries. Pulling out the drawer box provides some access to the frezer, but not enough to reach the faulty module. To get to it, we’ll need to remove the wood cabinet that holds the microwave at eye level. After ruling out several potential culprits, Bryan identified a faulty module, in a currently inaccessible rear corner. We can lift freezer out after we remove the microwave’s cabinet above it. Another project for the boat list, with the first order of business being consuming the food that is in the freezer now. Bryan thought the thermostat might be the culprit…but ruled it out after by-passing revealed the problem pesisted. Bryan also generously provided some DIY pointers for addressing an issue with our Fischer Panda generator. Bryan’s pro tip: make sure to put oil in the new filter when doing an oil and filter change. That helped get Allan over one hurdle (the generator shutting off within seconds), which allowed Allan to zero in on a broken impeller that was causing the generator to shut off after a few minutes. Given this weekend’s forecast gale, we needed the generator to be good to go if we lose shore power, so we were delighted to resolve its issues. The “feels like” forecast for tomorrow morning is -3 degrees. Yowza! Can you tell we are counting the days to Spring?